Lap Steel Guitar, Virtual electric guitar from Orange Tree Samples in the Slide series. Orangetree Samples announces an update for this Lap Steel guitar library and its inclusion into the new Slide Series. 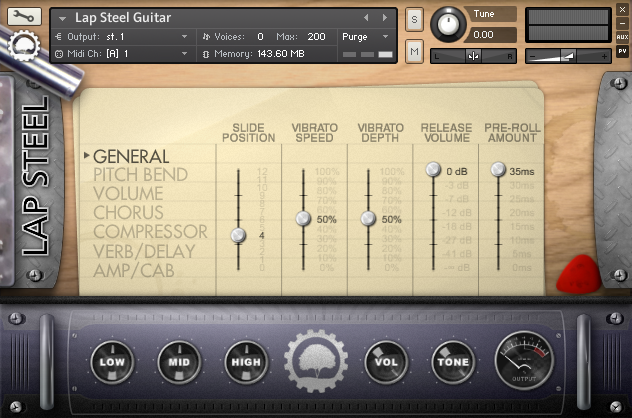 The update is free for users of the first Lap Steel version and adds a new preset system with the ability to listen to presets from within the sound library. Pitch Bend controls have also been revamped with the ability to include or exclude the first, last, highest or lowest note. Last, Orangetree Samples improved the vibrato/bend string feedback and included a Room Tone control if you want to add room to the amped sound. 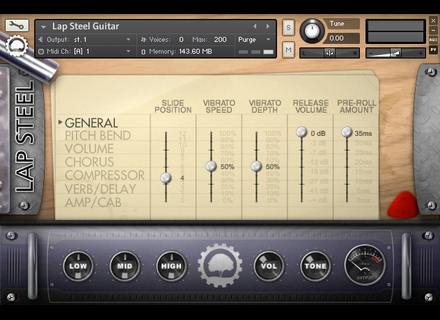 Users of the first version of Lap Steel will receive an e-mail containing a link to the free upgrade. New customers can purchase the library for the special price of $59 instead of $79 until January 13th, 2014 at www.orangetreesamples.com/slide-lap-steel. Last, note that Lap Steel has joined Slide Acoustic in the new Slide Series that will be completed in the future with new Slide instrument libraries. Apogee interfaces compatible with the new Mac Pro Apogee Digital announces that its Symphony Thunderbolt audio interfaces are compatible with the brand new Apple Mac Pro. [NAMM] Bitwig Studio details expected at NAMM 2014 The Bitwig team announces that the long-expected Bitwig Studio DAW should be available at the beginning of 2014. PSP launches a plug-in dedicated to Dithering PSP Audioware introduces X-Dither, a VST, AU, RTAS and AAX plug-in for Mac OS X and Windows designed for Dithering and Noise Shaping.